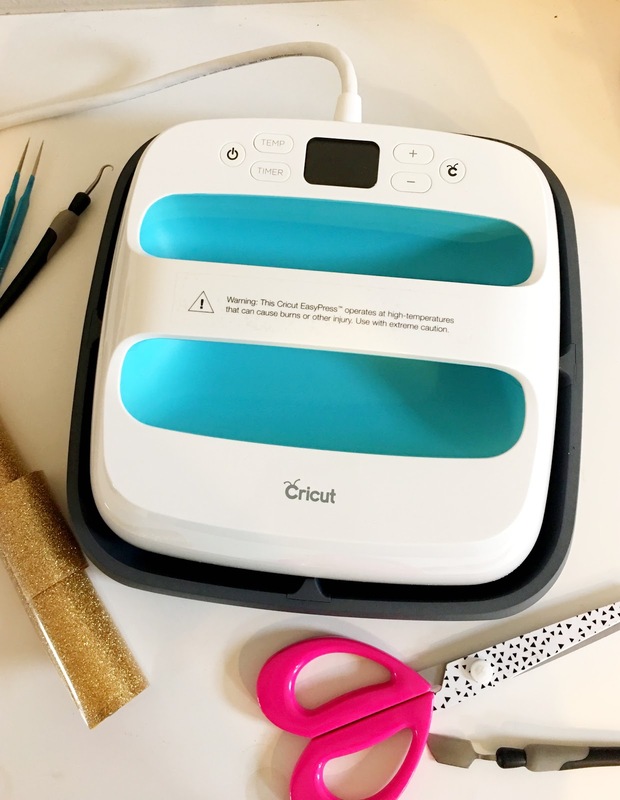 The Cricut EasyPress is quite literally one of the hottest new things to hit the market for crafters who work with heat transfer vinyl, rhinestones, and custom transfers. The Circut EasyPress is a cross between an iron and a heat press. It had me equal parts excited and skeptical so as soon as I saw it hit Amazon a few weeks ago I ordered one. (You may also want to price check at Swing Design where they also sell it.) I mention that because - like you - purchasing the $149 Cricut EasyPress allows me to be the consumer who paid their hard earned money on this craft gadget. I'm sure I had the same burning questions about the Cricut EasyPress as most of you who have had their interest peaked by the 9 x 9" portable heat press. Is the Cricut EasyPress really worth $149 (plus tax) when you can get a full size heat press for not much more? Can the Cricut EasyPress really provide enough pressure to successfully and consistently transfer heat transfer vinyl onto surfaces and prevent them from peeling wash after wash? 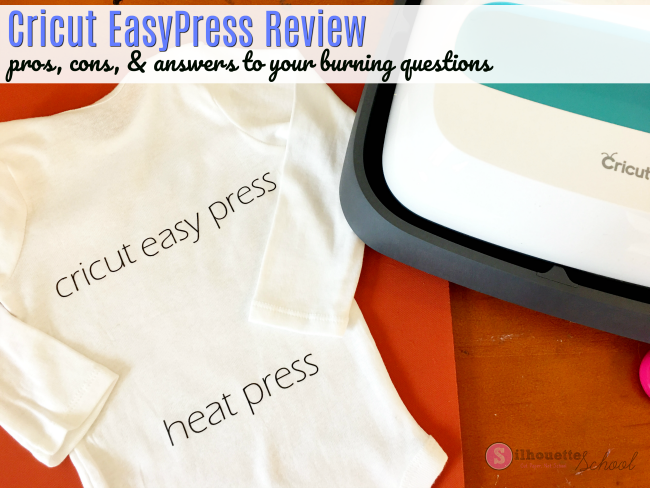 What are the real pros and cons of the Cricut EasyPress for crafters? Even before you open the box there are obvious benefits to using a Cricut EasyPress over a heat press - namely the compact size. For those crafters who don't have space to store a heat press - even a small heat press - the EasyPress, which has a 9 x 9" platen may be the answer as it can easily store in a cabinet, drawer or shelf. Plus, the small size makes it ideal on the go - think craft shows, crops, workshops, or traveling - wherever you want or need to apply custom presses. The Circut EasyPress, while compact, isn't 'light.' The reason heat presses work so well is because they apply both heat and even pressure. The EasyPress weighs five pounds (yes I put it on the scale) which in and of itself means there will be pressure on the heat transfer material. Unlike a heat press, where you can lock it and forget it for 20 seconds, the EasyPress does require added downward pressure from the user throughout the entire press. 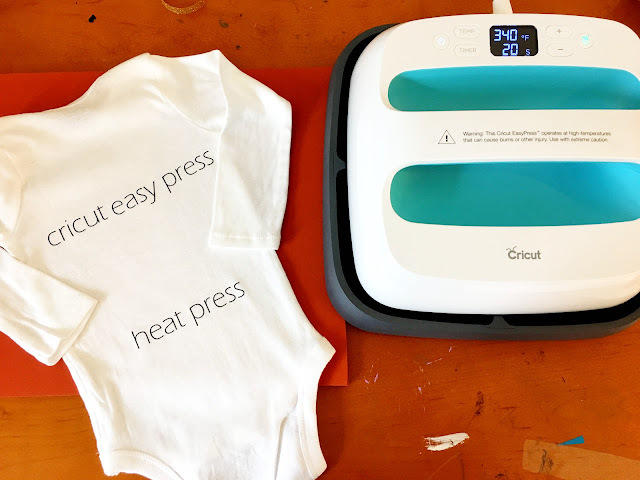 That will simulate the base of a heat press and, when placed on a solid, firm surface, allow you to best mimic a heat press while using the Cricut EasyPress. Alright so once you have everything you need, you want to keep the EasyPress in its gray base while you plug it in and warm it up. Press the power button and then press the Temperature button. 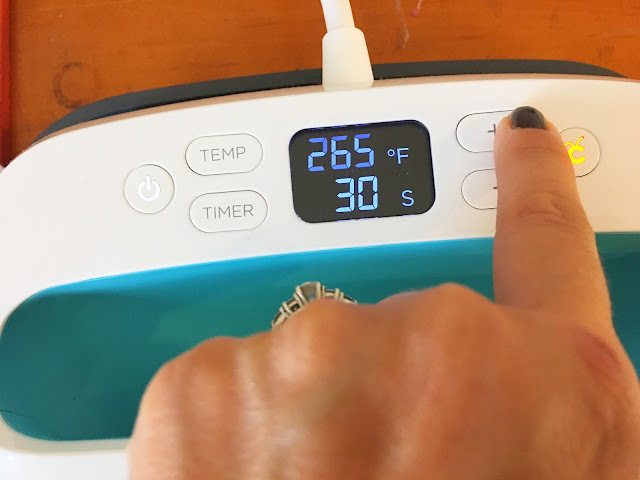 When the temperature starts flashing use the +/- buttons to change the temperature according to the recommended settings for the HTV and material you are using. Next, press the Time button. When it starts flashing, change the time the same way using the +/- buttons. Wait while the EasyPress comes to temperature - which honestly is very fast. 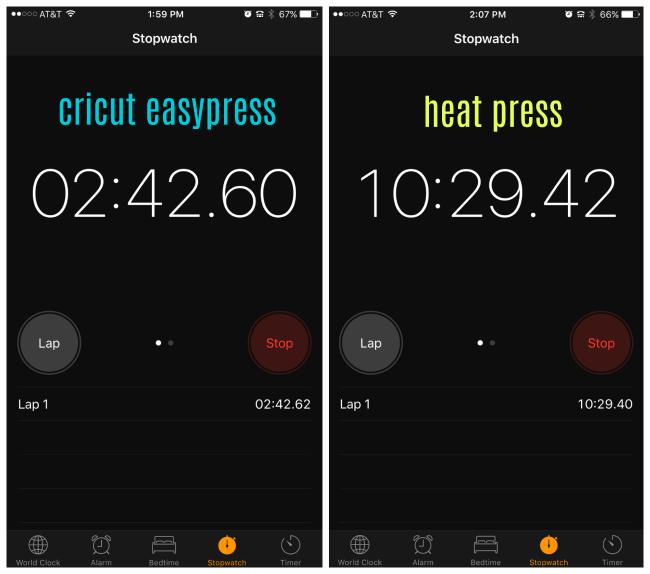 I time raced my Cricut EasyPress vs my trusty heat press and the EasyPress won by almost 8 full minutes minutes. It took the Cricut EasyPress just 2:42 to heat up from "off" to 305. 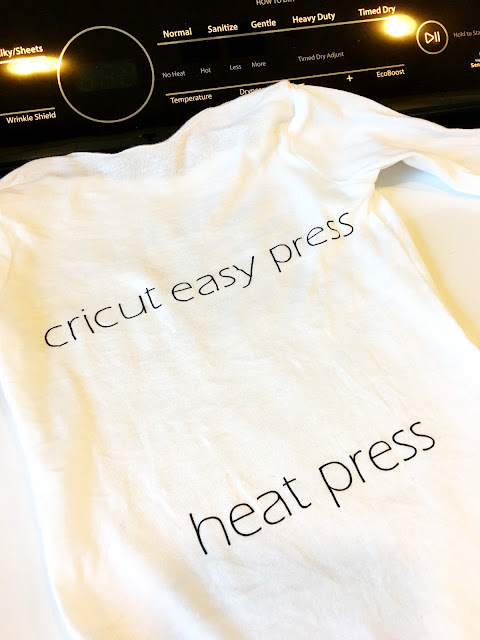 My heat press took more than 10 and a half minutes to warm up to the same temperature (in fact my Cricut EasyPress auto shut-off while we waited for the heat press to come to temperature). Where the Cricut portable heat press is lacking is in its maximum temperature range. Its max temperature is only 350 degrees while my heat press can go well over 400. For most materials this won't be an issue, but some materials such as sublimation and printed heat transfers require heat over 350 degrees. Prepare your heat transfer vinyl decal on the surface while you're waiting. Place the shirt or other surface flat on top of the silicone foam mat. Place the HTV decal on top of that. (I did not use a teflon sheet while pressing with the Cricut EasyPress). When the EasyPress has reached the desired temperature the orange light on the Cricut button will turn green and you're ready to press. Do not move the Cricut EasyPress around while pressing! Keep it still while applying pressure during the entire pressing time. When the timer beeps place the press back in the stand. Wait for the HTV to cool down before removing the carrier sheet from the heat transfer vinyl. Because I wanted to compare the HTV pressed with a Cricut EasyPress with heat press-applied HTV, I added another HTV decal to the same surface. The text was cut in the same font style and size to make sure no other factors impacted the press. I was also very careful to make sure the HTV applied with the EasyPress did not get double pressed while using the heat press. Now comes the true test...will the HTV applied with the Cricut EasyPress pass the washing machine test? Half a dozen washes later....and both presses still look as good as they did when I first applied them. So after using the Circut EasyPress and comparing it to the pressing quality of a heat press I'm a believer. There are definitely pros and cons to the Cricut EasyPress and whether you 'need' a Cricut EasyPress is really going to depend on what you see as a pro and what you see as a con. There is no question - the Cricut EasyPress results in a quality press....and I'm definitely impressed! Only because of the price tag, the 350 max temperature, and the fact that it doesn't include the necessary pressing mat, I'm giving the Cricut EasyPress a B+. 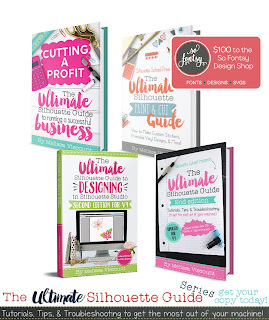 Grab a Cricut EasyPress from Amazon or Swing Design. I love that it's portable, but the small size of it and the fact that you need to add more pressure and press for longer amounts of time are an issue for me. If it were at least 11 x 11 I might be swayed, but sorry to say, this is a no-go for me. Thanks for doing this. I have been trying to decide what would be best for me. 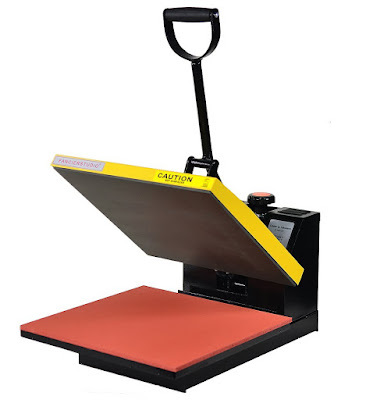 HI Do you like your clamshell heat press more than a swing away and why? Also, I noticed yours says Sublimation, what does that mean? Thanks for your unbiased review. The fact that you bought one to share how it worked means a lot more than the other reviews I've read from the bloggers that are in the Cricut marketing team and are being compensated for the product. I don't use a heat press for anything. The vinyl that I transfer is always quite small and haven't had problems using my regular iron. I do like the fact that the heat press has the base plate. THANKS FOR YOUR TAKE ON THIS !! Great review, Melissa! Thanks for the info' on the silicon mat. You ROCK!!! I found that when I use mine, it does NOT need any noticeable amount of extra pressure on my part. No need to bear down on the press, just firmly holding it in place does the job. A great space saver. 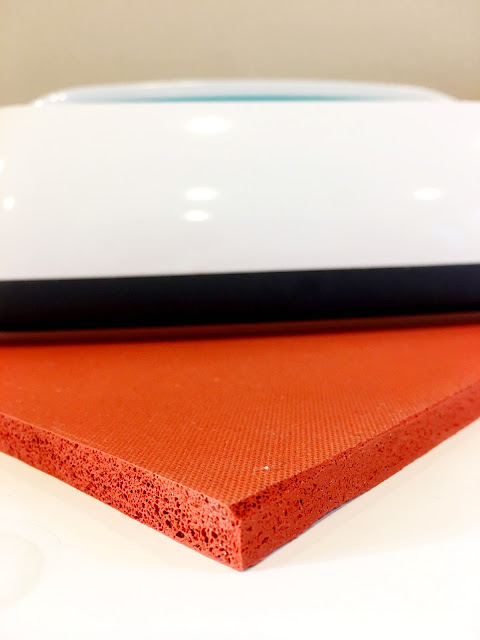 Do you know if you can use the silicone mat that Heidi swap has that is pink with a easy press? Thanks for an honest review of this product. I'd love to know how the easypress does with rhinestones! I make cheer bows and Oh this would be a lifesaver. Beautiful. I would also like to share another useful source on literary terms. Like the size. It would be easier to store in my craft room. That’s what I like about you....You tell it like it is regardless of the product/company. TY! It would be easy for on-the-go crafting! Would love to win this! Would be awesome! This would be perfect for me. I just craft for myself/gift and don't have too much space for a real heat press so this is a perfect middle ground. I would really like to try this heat press. I'd like to win a Cricut EasyPress because of its ease of use and size. I don't have the room in my craft room for a full size heat press. I love making handmade items for any shower I attend, so this would be great for all my pregnant friends showers in the coming months! I would love to make them some cute onesies!!! Looks cool! Hope I win it! I don't do a lot of heat pressing, I am mostly a paper gal, so this looks like the perfect thing for me! Thanks for the review! There are are so many t-shirts I could make! Thank you for a very helpful review! Wow! How great of a Christmas present would this be!? I would love to have this for making custom shirts for next Christmas. We always do match family shirts! I've had my eye on the EasyPress Love how small, fast, and easy this is! I bought one and then had buyers remorse and returned it. I would LOVE to have this and retire my conventional iron for my HTV projects! What a great product! Would love to have something besides my iron to heat press! I want to get one of these so that I can do craft show orders and baby shower events with it.. It looks much more portable than trying to take my big press with me to shows and events! It's perfect for me as I don't have room for a reg size press. 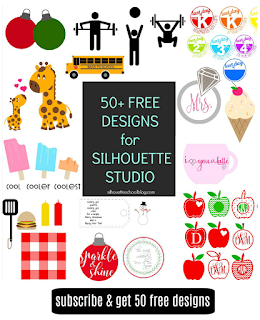 Would LOVE to win this to use at craft shows and on the go! Thanks for the awesome giveaway! I hope to have one someday. It isn't in the near future for now. I would love to win one. I have been watching all the videos. I'd love an easy press. My craft area is small and I love the idea of a press that's not going to take up half the counter and is too heavy to move. I’d love to win for my business use!!! 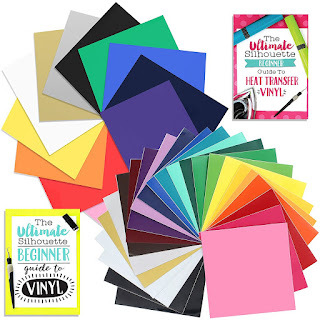 I'd love to win a Cricut Easy Press because I've started a collection of HTV and havn't really attempted to try it out yet because I only have an iron and it has tons of holes in the bottom of it. It'd be great to actually do some of my projects. I would love to win the easy press to use for making shirts for my kids. I haven't invested in a full size press for lack of a place to store it. Thanks for the review and giveaway chance. I would love to win an easy press because I can use it for baby jumper design stations at baby showers or use it at other events without having to lug my heatpress with me. I hope I win! Awesome! Thank you for all your tutorials!! Anytime I need help, I search your database and there is a tutorial for it. Makes working with my Cameo so much easier. I love this! I don't have a full on Silhouette office set up. I usually get a towel and my iron out and do my shirts on the office floor. lol.. that's sad. This would be perfect! Small and compact enough to easily store away in my small office but it gets the job done easier than my rink dink iron! Thanks for posting this giveaway! Fingers crossed! Great giveaway - Thank you for the comparison to a heat press! I would love to win because this. Would love to have one of these. Not much space in my "play room"! I love how portable it looks! It would be perfect for my craft room! Wonder how it works with HTV used as applique in embroidery? I’d love to win so I can lay out my designs and know they are centered to press. Right now I do a two step process with the iron to tack it in place and then the heat press. Would love to eliminate a step! I would LOVE to try this EasyPress!! I’d love to win a cricut ez press because I don’t have a press. This would be awesome! This would be great to help me expand my home embroidery business. Plus my first grandbaby is due any day now! I could make super cute stuff for her! I Love to win Because i niet take it anywhere i go! I got my silhouette to make planner stickers etc. but then I started seeing shirts and stuff I wanted to make and now I want one. Would love to win! This would be awesome! Thank you! i have not been able to afford a heat press, so I would love to win this as a step up from using an iron. I am just starting out in crafting and vinyl - for fun and for family. I would love an EasyPress to make my projects look more professional! Thank you for entering me in this contest! This would be great to help expand my home embroidery business. Plus, my first grandbaby is due any day now. I could make her such cute stuff! I would love to win one! It would be great to travel with when I take stuff to my sisters or mothers house to press stuff for them! Much easier than messing with an iron I would think!! This would be wonderful- I wouldn't have to lean so hard on my iron anymore! This is a great portable option!! This is awesome!! I have wanted/needed a heat press for a while now but couldn't find the room to put a larger one in. This would be the answer to all of my prayers, haha. I love it! I like that it’s compact. My craft room is a shared space and doubles as our home office. So we are limited on space. This would work well for me. It’s compact enough I can store it in my desk. While the coverage area is small and the temperature isn’t as high those don’t bother me as much since I don’t do heat transfer as often. Thanks Melissa! This would be a great portable option for me! Thanks for all your reviews! I can't wait to try this product! Thank you for your honest review of the Cricut Easy Press! I have wanted one from the moment they came out. Two reasons I didn't get it 1) I wanted to remain loyal to Silhouette 2) They sold out fast! The main reason I want it so badly is my lack of space for a heat press, plus I want the flexibility to do craft shows and make shirts on the spot. What an amazing giveaway for the winner! I WOULD LOVE TO WIN ONE OF THESE AS IT IS SMALL AND I HSVE VERY LITTLE SPACE IDEAL. At this time I don't have the space or strength to pick up,place, or store, a traditional heat press! 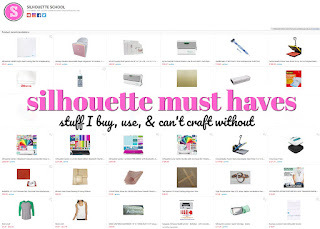 For these reasons a Cricut Easy Press would be perfect for me! I'd love to win one so I could apply HTV much easier on the baby items and other small projects that I make using my home iron! Thank you, really great insights into this product!! I currently have no room for a heat press so this would be great for me. I love that it's more compact and portable versus an heat press. I would love one of these. I too have a small craft space and my Heat press takes up a lot of room. Merry Christmas and good luck everyone! This is perfect! as I have limited space. Thank you Melissa for the opportunity to win this little gem. I would love this as an extra heat press for doing lower temperature craft items where I don't need my heat press and for the portability of it. I actually almost bought one the other day. I bet this is so handy for on-the-go crafters! 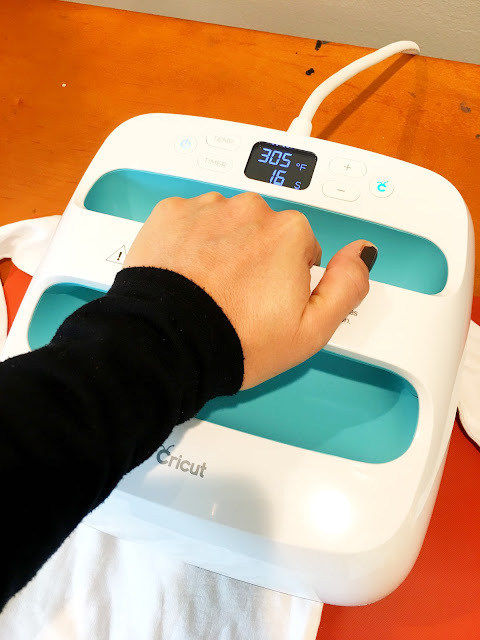 I would love to win the Cricut Easypress because I plan on doing alot of trade shows next year and it would be alot easier for me to pack the easypress instead of my big press. This would be awesome to use. This heat press looks like the perfect size to be portable. So cool would love one!! Thanks for the video and review. I'd like to try one only because I would use it for pressing smaller items. Looks a lot easier and better than my iron. I love the idea of a full-sized press, but this Easypress seems versatile for us occasional HTV-ers. I'd love to add this to my craft room so I can retire my old clothes iron! Love the size of this! I don't have it really need yet a heat press so this is the perfect compromise for me. I would love to win an easy press because I am still using my iron for htv and it is a STRUGGLE. I have disc and nerve problems and the amount of pressure needed to apply htv using my iron is excruciating for me. My kids ask for shirts all the time and I have to wait until I'm having a "good" day before making them. The easy press would make my life so much easier. It would even allow me to start selling more of my items and earn extra income as a stay at home mom. 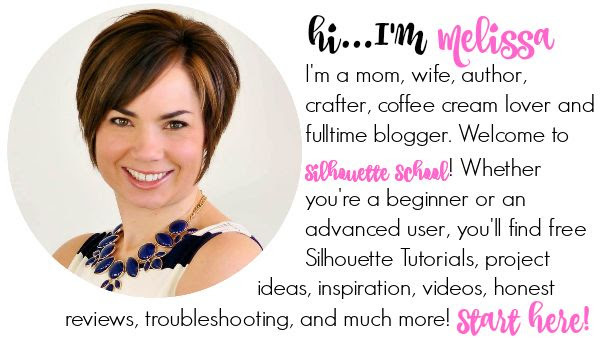 I have learned so much since I started following silhouette school. I love watching the honest reviews and tutorials. Thanks for all that you do! This would be awesome to take to crops! This is awesome, and how adorable lol. I dont own one but it think it would be so perfect for Onesie, and items with creases which causes off balance even pressure. I would love to have one my daughter just had a baby November1 and i could just imagine all the cute onesies i can make her. This is a great resource for trying to decide between an Easy press and a tradional heat press as I am doing. This is one of the best reviews I have seen on the Easy Press. Thank you for doing this. this would be a good press for me just getting started! Thank you for all you do for us crafters!! I have a little grandson and so many ideas for gifts for him. This would be perfect for creating them! I make cheer bows and this would be perfect! I haven’t tried HTV yet because I am scared to mess it up using just my at home iron. I would LOVE this press and promise to give it a great home! I would love to win the easy press.. I have absolutely no room and this would be perfect!! Love easy this is to use. Would love one! Great review! My son & I are just getting started and I would love to have one! I especially like that you compare things. It helps shorten my research time. Thanks for everything! Great review!! I've been looking at the easy press - if I don't win it I might have to ask Santa for one. I don’t know if this is the right place, but I would love to win the easy press. I think the portability is a neat and it seems pretty easy to store. My craft room is full to the gills but I think I could find room for this. I love a world wide giveaway :D. I would really like to win this one, because I only have an iron now! Would absolutely LOVE this Easy Press! Looks so easy to use and with my just getting going, this could make things much easier! Looks like a great option for a quick press without heating up the big workhorse. I'd love to try it out. Thanks for showing the differences between the easy press and a heat press. For just a "quick" press of one little design it's a great thing to have an easy press. Especially because it heats up so much faster :). I would love to have an easy press also because you can position your fabric on a mat first and don't have to take carel if you touch the hot plate, then press your htv. And third of all it's great "to go" and press some designs at a friend's house while sewing together <3. I would love to make more shirts and baby clothing with this awesome press! I would LOVE to own one of these! I'm so tired of trying to use an iron to adhere the items I make! Looks like a WONDERFUL machine!! Oh my! This would make small projects a little quicker! Love! Thanks for the review! I would love to win the press. It is portable and perfect size for toddler shirts and onesies!!! I love making shirts for my kids and embellishing pillows. This easy press would be so handy. Thanks for the review! I can't decide between the easy press or an entry-level heat press. I like how small it is. Maybe I need both? I have been debating between this and a heat press. After this post I am seriously thinking this is the better option for my usage. Thank you!!! I would love an easy press because I have no desire to get a heat press. I have not attempted htv yet and would love to play around with it! I have been using my iron and body weight to try to make shirts for a while. I have had to go and repress of few. I'd LOVE to give this a try! I would love to have the easy press because it is small and easy to store, and because it would be great for a ton of the projects I do!! Thank you for the awesome chance! This is so amazing of you to do this giveway!! Thank you. Even though I have a heat press I would love one of these easy presses just for convience! It would make it so much easier to make htv items!!!! I've stocked up in Cricut vinyl in hopes of someday owning an Easy Press! I have so many projects in mind and there's always lots of inspiration everywhere. I'd love to be the happy new owner of this one! I'd love to win this did that I can finally try out the HTV I bought without having to use an iron. I would use it to make gifts for friends and family. I’d love to win the Easy Press because I have very limited space in my craft room. Plus I can take it to my daughter’s house so she can use it, too. She is just starting out with HTV and can’t afford a heat press. I would love to win one - could take it on the go and do up things when I travel. Looks amazing. I ❤️ Making gifts for my friends and family, having this press would definitely im’press’ them with my new found skills 😄. Thanks for all the time and work you put into tutorials, your videos have saved my rear many times❤️❤️❤️! I'd love the compact size for smaller projects and for traveling! I am so short on space, I think this would be a perfect solution! Thanks for the tutorial. You always make info clear and easy to understand. I would love this! I had to give up my craft room when my youngest was born, so the portability of this press is perfect for me! I have seen good reviews on this product. The portability is ideal for me since I don't have a lot of storage space. I would love to win one to try out! 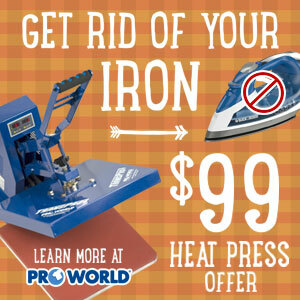 I would love to win an Easy Press because it is portable, smaller than a heat press. When will she(it) be available in Europe? I have a heat press and would be nice to see how this Easy Press compares to it. Would love to make tshirts with Easy Press. My iron just isn't good a good enough job. Would love to have this to try! Thanks for the chance to win! I would love to win this to make shirts for my girls so the vinyl actually stays on! �� Thank you!! Looks fun, would love to win it, using my iron is hard. I would love one of these. I would love the ease of taking it to go and getting to craft on the go and not just confined to one place. I already have a heat press, but the portability of this would be awesome! Thanks for the chance to win this awesome prize! I would love it to make shirts for my girls so the vinyl actually stays on!! Lol Thank you!! I would love this tool - such a space saver! I would love to make shirts for my Color Street team of girlbosses and other fun things! I would love to have an easy press for all my HTV projects. I love that it is portable and you can take it on the go. Thank you for your detailed review on the Easy Press. 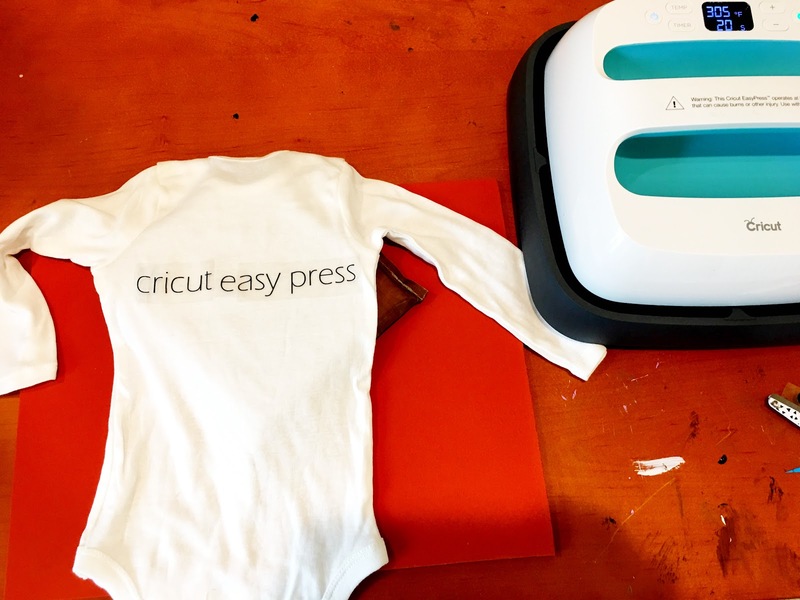 Just as I start looking into other things my Silhouette can do other than paper and card cutting, along comes the opportunity to win the Cricut Easypress. Fingers crossed for a lucky entry. I've been going back and forth with a decision on this. Love that it's portable, easier to setup taking less space, and probably doesn't give off the heat and warm up the room like a heat press but I love my heat press that it applies all the pressure for me and I've always gotten great results. Melissa, you have me tempted again. Thanks for the chance to win one!! I would love to win this. it would work way better than an iron!! I would love to have a machine like this! You do bring up a good point that it costs just about as much as a normal heat press, but still, the convenience and portability of this press would open up so many on-site opportunities! I love the idea of having a portable press and it doesn't look like it would take up much room when storing. I would love to win this. Right now I use an Iron or my tiny iron. I don't have room for a heat press, so this would be amazing. Oh My GOODNESS!!!! I would love love love one of these!!! I have been eyeing them for a while now! I would love to win one of these. I've just started using HTV and this would make the learning curve easier to do! I would love to win one of these to start making my kids some cue clothes! Thank you for the comparison. I'm waffling between the both types. I would love to win one of these so I can give it to my mother. She has given me so much (including lots and lots of crafting supplies) that I would like to be able give her something that she really wants. I’ve always used my iron for HTV with no problems, but I’d love to give this a try! Looks like a pretty awesome tool! Thank you for the chance!!! I don’t have a lot of room so this would be perfect for me. I love the size and how convenient it seems to be! I would love to try one! I am super limited on space so this looks amazing!! I would love one of these! I mainly do small projects, on it would be perfect! Would LOVE one of these! Looks so perfect for my tiny craft area! I would love to win this machine! !